Delnor-Wiggins Pass State Park is ranked one of the top 10 beaches in the nation and offers an unforgettable tropical beach experience on this beautiful barrier island in Naples, Florida. The best part of the park is, of course, the incredible sandy white beach with sparkling blue water. Spend the day relaxing on the beach, swimming, boating or snorkeling. 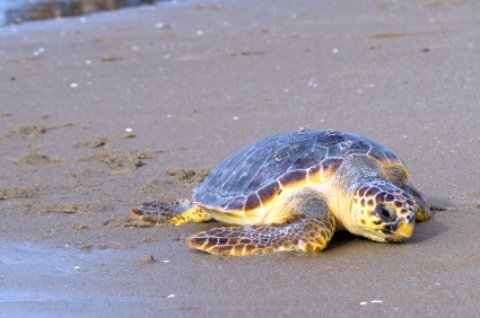 During turtle season- generally from the months of June to October, experience an amazing tour to learn about the loggerhead turtles that inhabit the park. Make sure you arrive to the park early, as the beach is so popular during the summer months that tourists and locals alike flock to this paradise escape. There are great opportunities for shelling; this beach is touted as one of the best shelling beaches in Florida. Be careful not to overdo the sun as wonderful as it is, it can spoil a vacation. If you want a reprieve from the hot sun for a while, get up, get moving and you can explore one of the nature trails, or enjoy the view from the small observation tower, or even enjoy the interpretive exhibit on the wildlife inhabiting the park. There are plenty of opportunities to observe the wildlife firsthand as well, such as migratory shorebirds, bald eagles and varieties of tropical fish. The fishing is also great here. There are several places to fish including the Turkey Bay and Cocohatchee River, all of which provide a beautiful and comfortable atmosphere in which to give your vacation that extra magic touch!. If you enjoy beautiful beaches, and who doesn't, with spectacular views and lots of seclusion, then a visit to Delnor-Wiggins Pass State Park is definitely for you! What to Do: Naples is a very popular vacation destination so there are tons of activities to choose from. For great fun in the water for the entire family, check out Naples Watersports, where you can rent wave runners, jet skis and other water toys. For the kids, try the Children’s Museum of Naples which features exhibits that will inspire imaginations and be fun for kids of all ages. Where to Eat: There are so many great places in Naples, it’s hard to choose just one. The Dock at Crayton Cove offers a taste of the wonderful seafood in the area and provides a great view of the Naples Bay. Where to Stay: There are hotels in the area to suit every taste, so it just depends on what you’re looking for. Doubletree Guest Suites are a comfortable, spacious choice. The staff is friendly and you can get warm cookies at the front desk at any time of night or day, which is a unique and cozy feature.